With the evolution of the engine also came an evolution in design. Initially the boats were long and thin, with a beautiful sheer and no house. As more power was introduced the boats got wider and longer with big wheelhouses, giving the fisherman much more deck space to work from. The 30 footer with a beam of 8 feet in the 1950s is now a 40 footer with a 16 foot beam. Organized races were run as far back as the 1920s, but were not truly organized until the Beals Island-Jonesport race in 1963. 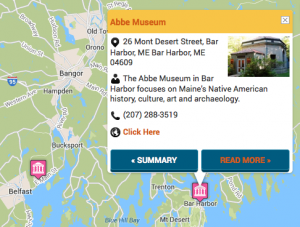 Over the years more harbors have joined Maine’s answer to NASCAR. 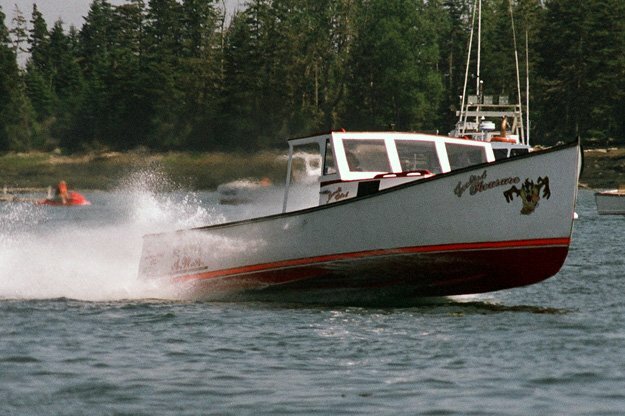 Formed in 2002, the Maine Lobsterboat Racing Association oversees races and hands out awards for five gasoline classes and 14 diesel classes at the end of the season. There are a number of crowd favorites. The big winner over the last several years has been Galen Alley’s FOOLISH PLEASURE from Beals Island, which also set the gasoline and over speed record of 72.8 mph at Stonington in 2011. Another crowd favorite is Alfred Osgood’s STARLIGHT EXPRESS of Vinalhaven, which holds the diesel speed record of 58.9 mph set at Portland in 2010.